Does trade balance really matters? Trade has been a major catalyst of the spectacular growth of the world’s economies. Why this is so, are well explained in many studies out there, including that of our 259 Trillion Vs. 5 Trillion Book Series. Trading between nations differ very little with the incentives of trading between two individuals. Trade enables specializations and thus increases efficiencies, qualities and many others. In our current modern economy, trading with other countries is an essential part, and without it, progress will be slower and the risks, higher. Many people thought that it is good for their country always to always have a trade surplus. The reason is simple; the country would seems to be selling more than making purchases, and seems to be accumulating money as a result. If every country strives to have a trade surplus, what will happen? “No matter how hard they try to have surpluses, some countries are predestined to have trade deficits”. The reason is simple, trade balances of every nation is a zero sum game! It is true, adding all of the deficits and surpluses of every country would yield, zero. The moment a particular country has a trade surplus; one country out there is surely and predestined, to be having a trade deficit, no matter how hard it tries to have a surplus. It is a law of mathematics. According to the World Trade Organization (WTO), the total merchandise exports of all countries in the world is USD14,851 billion and for imports, it is USD15,077 billion (data is for 2010). The numbers are almost balance, as it should (except due to accounting errors, and due to trades not properly recorded). It is balanced (exports equal imports) because all exports from all countries are the source of all imports for all of the other countries. Illustration 2: Trade balances between the world’s regions. So if some countries are having a large trade deficit, is that bad? Conversely, if a country is having a trade surplus, is that good? Over the years, collected data has offered us valuable insight into the potential answers to these provocative questions. Let us look at two particular countries, first the United States. Data: U.S. Census Bureau, Foreign Trade Division. Illustration 3: Historical America trade balances over several decades. The United States has incurred trade deficits for decades, since 1973 to be precise (39 long years). The total trade deficit for the entire period? 8.5 trillion dollars. Where on earth, a country can continue to finance repeated trade deficits, year in and year out, without problems? The US presented the world with an interesting answer; yes, it can be done. Now let us turn our attention to another country, of different nature, one that persisted in registering large trade surpluses, year in and year out, for decades (except for 2011, where Japan recorded its first deficit after nearly 30 years). 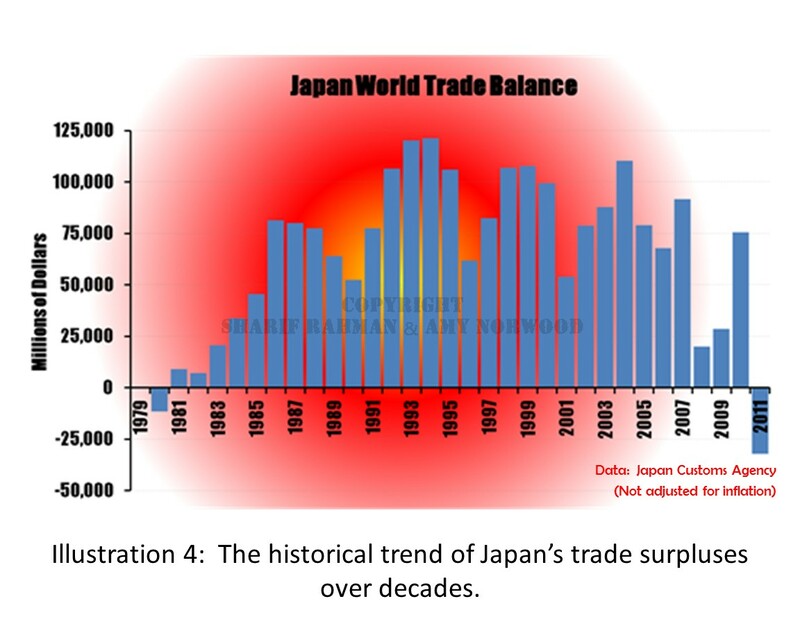 Illustration 4: The historical trend of Japan’s trade surpluses over decades. 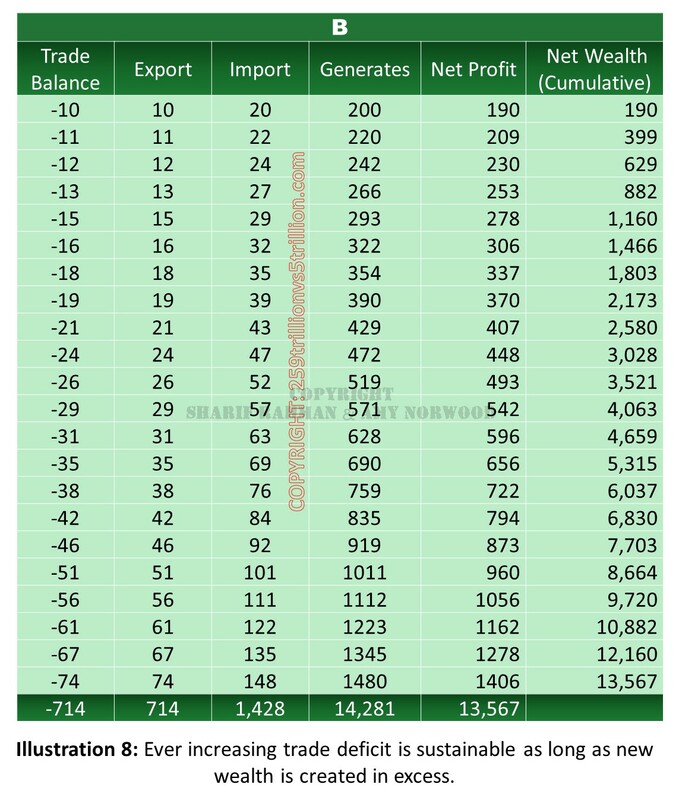 So how much is the total accumulated trade surplus? The illustration below showed the comparison between both countries; one with persistent trade surpluses and one with consistent trade deficits. Yet, despite persistent trade surpluses, Japan is nowhere richer than without it, for, its net wealth was declining steadily since the collapse of its real estate bubble in early 90s. Regardless of considerable and persistent trade surpluses totaling more than two trillion dollars, Japan’s total wealth had actually decreased. Of course Japan has their own personal problems (discussed extensively in Book 3), but trade surplus, according to many economists, should push their wealth level upwards. It did not happen. Illustration 6: Japan’s net wealth continues its steady decline, despite persistent high trade surpluses over decades. Is there even any correlation to exporting and making large surpluses, to overall net wealth? America on the other hand, continues to increase its wealth nicely, despite its trade deficits, as illustrated in the next illustration. Were all economist wrong on this issue? To be sure, there are countries that do increase their net wealth with their trade surpluses but similarly, there are those who are having deficits, but are still adding wealth. As for the USA, it is the opposite of Japan. It has added considerable amount of wealth, despite its large and persistent trade deficits. As we wrote in the 259 Trillion vs. 5 Trillion book series, America is not bankrupt. It has plenty of wealth to back up all of its commitments. Illustration 7: Polar opposites? America builds up wealth with its large trade deficits. So is there even any correlation between large trade surpluses, to wealth? We are so accustomed to the statement that exporting countries with large trade surpluses are good. However, that is not an always-true statement. So is there even a correlation between trade surplus and wealth? Is it good to have a trade surplus? Or is it good to have trade deficits as shown by America? In order to answer these questions, we must project what will happen to a country with persistent trade deficits. Again, the main question here is, can such deficits continue indefinitely? And without any harm to the country? A nation can buy from the outside, and use those purchased goods and services to increase its wealth, because if such purchases were used to assist its new wealth generation endeavors, its net wealth would increase. Now, let us check the simulation. Illustration 8: Ever increasing trade deficit is sustainable as long as new wealth is created in excess. The simulation is set-up so that everything in the economy, including trade deficits will grow 10% a year. After many years, the trade deficit grew by seven times of its initial level. The impact to the economy is insignificant because the wealth of the country grew by seventy-one times of its initial level. The key here is, as long as more new wealth is added, the country will be better off, regardless of whether it is experiencing trade surpluses or deficits. So what is the ideal level? Technically, trades would never be balanced, because countries have different needs and specialties between them. If you are borrowing $1,000 a month to help your business grow by say $3,000 a month, and if both of them increase by 10% a month for the considerable future, would you be okay or not? Similar with the simulation above, you would be just fine, and your profits from your business, would be growing larger. In just 18 months, your borrowing costs would be $5,560, an increase of 5.5 times, but your profit would be $16,680 (also increased by 5.5 times). Your accumulated wealth would be $107,434 with a surplus of $56,275 when the debts are deducted. Thus in this example, the deficit of $1,000 a month can continue indefinitely (as long as more profit is made). The same applies for the minimum and most basic of all trade; a trade between two individuals. Illustration 9: When two person trade, they add value to their existing products and can sell them at higher prices, even if one of them consistently having trade deficit. The simulation shows that trade would benefit both parties as expected. If they do not trade, their output would be lower. Person A for example, with his own flour and the newly imported sugar, can now add value to its main product (flour) by making say cake or bread. Now the person can sell it for higher value with greater demands. Same goes for person B. Despite one person is having a persistent trade deficit with the other, both of them come out ahead. It is not a problem for person B to pay off the trade imbalance, because he or she is making much more. In this instance, the trade deficit is a mere book entry for acquiring raw resources. So as shown, trade deficits don’t matter, as long as the country is making more new wealth. The country also has no problem to finance its deficit, because the money would be recycled back into its economy, buying the newly created wealth. This has occurred in America for the past few decades, and it can continue for years down the road, ONLY as long as America continues to make more new wealth. So the next time you look at trade imbalances and how politicians squabble over it, relax and just laugh, because they have no clue what it is!